Richard Adams (1920 - 2016) British author of 'Watership Down'. Richard Adams was born in England in 1920 and lived in the South of England with his wife until his death in 2016. He studied history at Oxford and worked as a civil servant in Britain's Department of Environment, were he developed concerns about the environment that he has conveyed in his books. His first novel, the popular animal fantasy Watership Down, concerned a group of rabbits whose home was threatened by development. He began telling the story to his two daughters, Juliet and Rosamund, during long auto trips. They insisted that he publish it. After two years of writing he submitted the book only to have it rejected by thirteen major publishers before the small press of Rex Collings took it on. 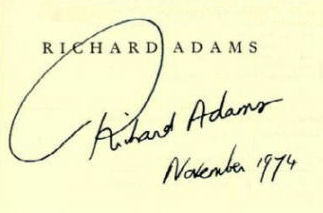 Adams has also published non-fiction books, an autobiography, short stories, and has edited several anthologies. Content provided by: The Prints and the Paper.